I’d like to welcome Graphic Novel Expert Steve Weiner to this blog, starting with the post right before this one. Steve was one of the first librarians to recognize the power of comics to bring youth to reading and its worthiness as a library item. He has championed comics into libraries for decades, in fact. My work relationship with him goes back to the nineties at least where he helped us put together a targeted mailing to libraries when we were among the first to get GNs recognized by library associations such as Rick Geary’s Jack the Ripper going on the YALSA reluctant reader top 10 Quick Picks over 15 years ago! 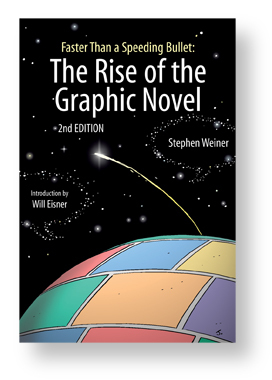 Previous Previous post: What Forces Led to the ‘Graphic Novel’?